From Silestone bathroom worktops to Classic Quartz bathroom flooring, your wet room or bathroom refurbishment will dazzle and delight with just a few keen touches from Pure Quartz and our expert design and installation specialists. While we offer office and kitchen installations in a range of different quartz finishes. Our quartz bathroom worktops really inspire our clients – go for a black or white quartz bathroom vanity top or a Cambria Quartz sink. Bespoke designed and installed to ensure that you can relax and unwind in the utmost luxury and style. Quartz bathroom worktops from the likes of Samsung and Arenastone look fabulous alongside modern or contemporary bathroom installations from a variety of different specialists. We will work closely with you to produce your dream quartz bathroom worktops in line with your existing décor, your preferred aesthetics and more besides. You simply need to let us know how we can help – and what’s more, our affordable, low cost services are available on a buy now, pay after installation basis. So you don’t need to pay a penny until the work is finalised to your tastes. 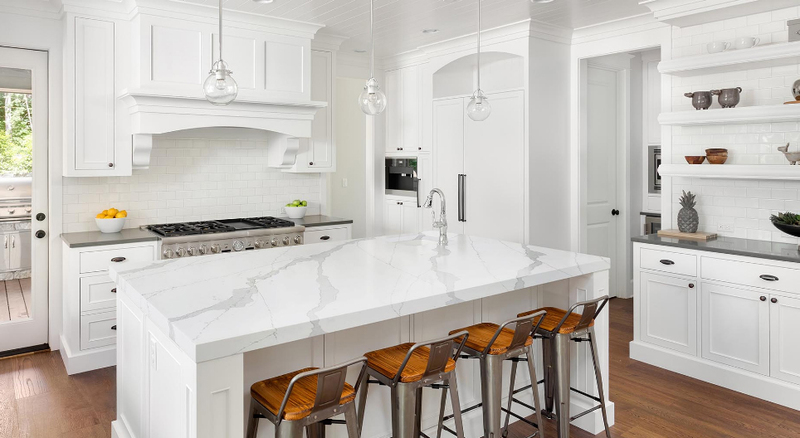 We are specialist of quartz suppliers and experts based in South East London, Our team will be happy to visit and install a range of quartz and stone options for your home and its variety of rooms at short notice. From kitchens to the living room and custom designs. Bathroom installations are amongst our favourite specialisms – and you will need to ensure that you partner with trusted professional dealers and fitting experts to ensure that you get the best quality quartz, the ideal design and the best finish for your money. With Quartz Care, too, our leading finishing and after care services are open to you once everything is set up and cleared. This means that you can enjoy your sleek, stylish quartz bathroom worktops for years to come with the protection of the best advice and supplies on the market. What’s more, we offer the best prices for what we supply throughout Lambeth, Bromley and beyond. We are a UK specialist in Quartz and a variety of other stone choices – and our partnerships with the likes of Santmargerita, Cimstone and Istone have allowed us to build up an impressive portfolio and catalogue of black and white quartz bathroom worktops and more besides. If you are in the process of having a new bathroom installed and love the idea of introducing dazzling quality quartz into your home. A quality which will shine for years to come – Pure Quartz are the team to call across South East London, Lambeth and Bromley. Call our experts today for a reliable quote which will be flexible for budgets and completely custom to your needs – the number is 01233 733111. Alternatively, do email us with details on your upcoming refurbishment and let us help you make the most of your new-look bathroom installation. We’re flexible in full project management so you don’t have to be – let us show you the wonderful world of quartz for less!